﻿Liberty's Troops is a non-profit organization whose primary purpose is helping small children fight big battles. ​Thank you for making our annual 5K walk/run a big success in 2018! Want to Nominate a Child? See nomination form at bottom of page. Or click here. Picture taken at Liberty's Troops 3rd Annual Fundraising Event - August 22, 2015. Thank you for your support! 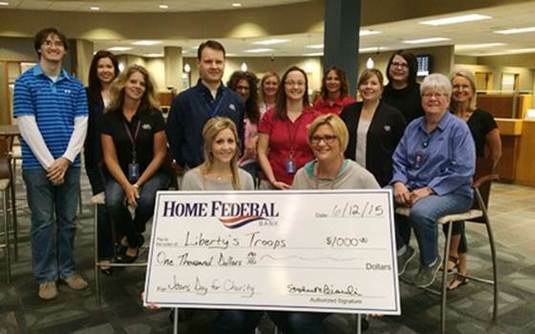 Home Federal's "Jeans Day for Charity" raises $1000 for Liberty's Troops! ﻿Recently, a group of Home Federal employees presented $1,000 to Liberty’s Troops! The donation was made possible by their employee-funded "Jeans Day for Charity" program. Liberty's Troops was formed in memory of Liberty Amdahl. Liberty died at the age of 2 1/2 after a 9-month battle with stage 4 Neuroblastoma. Liberty was a sweet, thoughtful, kind, smart, and strong little girl. Liberty always put others first before herself and taught us more in her short time than some do in a lifetime. She taught us to dance, love, and live life to the fullest. Liberty went to meet our Savior in heaven on May 31st, 2013. Her parents Cody and Leanne wanted to find a way to remember Liberty each year, while helping other families in need of assistance with travel expenses, groceries, medical expenses, etc. Liberty's Troops is a non-profit organization whose primary purpose is helping small children fight big battles. Proceeds of the fundraising events will be distributed to families with children fighting serious illnesses. If you know of a family in need, please nominate them to receive funds from Liberty's Troops.